In our latest Distributed Proofreaders release, the Motor Stories saga continues with its twelfth adventure: Motor Matt’s Peril; or, Cast Away in the Bahamas. 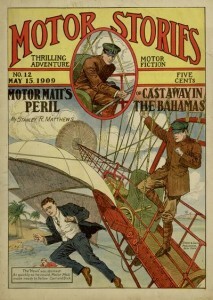 In this adventure, Motor Matt and his friends run an air ship show in Atlantic City but soon find themselves sidetracked by an adventure involving a treasure map and a submarine. The volume is rounded out with a handful of brief, randomly selected non-fiction pieces covering such topics as hunting, gum collecting and willow farming. The entire book can be read online or downloaded in electronic formats through Project Gutenberg. Images of the original source material can also be viewed in our Digital Library.